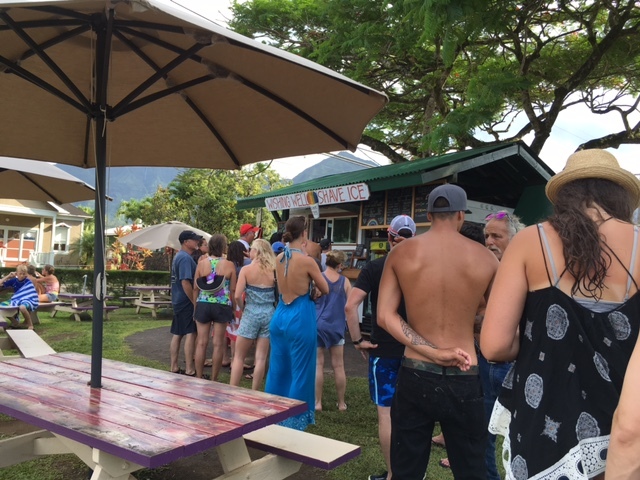 Wishing Well Shave Ice, located in Hanalei on the north shore, may be Kauai’s most well-known shave ice vendor. 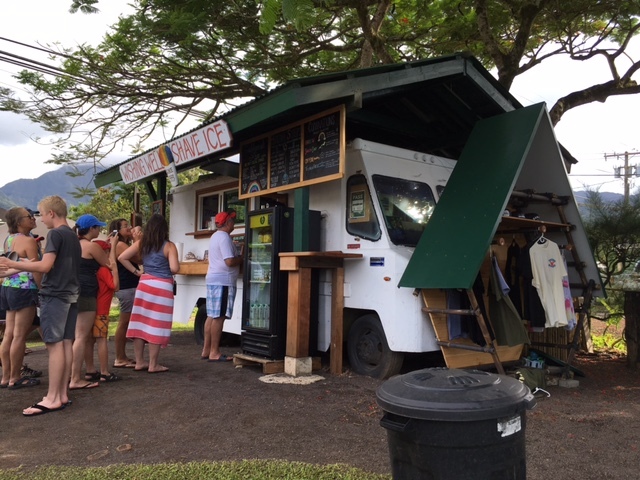 It at least has had the most famous customers – there used to be a board posted out front where celebrities visiting Kaua’i who stopped by for a shave ice signed their name (including Ben Stiller, Pierce Brosnan, Robert Downey, Jr. and more). There were no famous people in line the day Brett and the girls stopped by, but as you can see from the long line, it’s still a very popular place. Brett and the girls stopped at the little white truck on their way home from their Kalalau Trail hike last week. Wishing Well has a fairly extensive menu, and offers both their own flavor combinations as well as allowing you to mix traditional and homemade flavors (only two though). 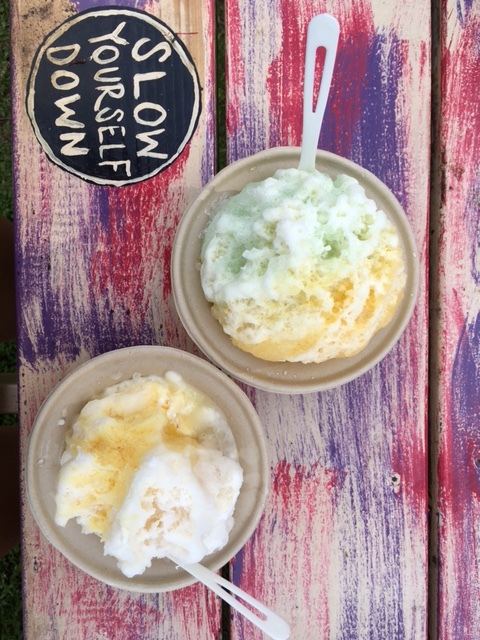 Their traditional flavor shave ice also is available in three sizes, keiki (kid), small or large. The first time we visited, with friends Todd and Laurie, we were warned that the women who worked in the van liked the orders to be made in a particular way: size first, then ice cream flavor, and finally the shave ice flavors . . . or else. The women were known to get surly if you did it wrong. The girls and Brett said there were no such issues this time with the young people working inside. Wishing Well offers both traditional syrups as well as homemade organic syrups. 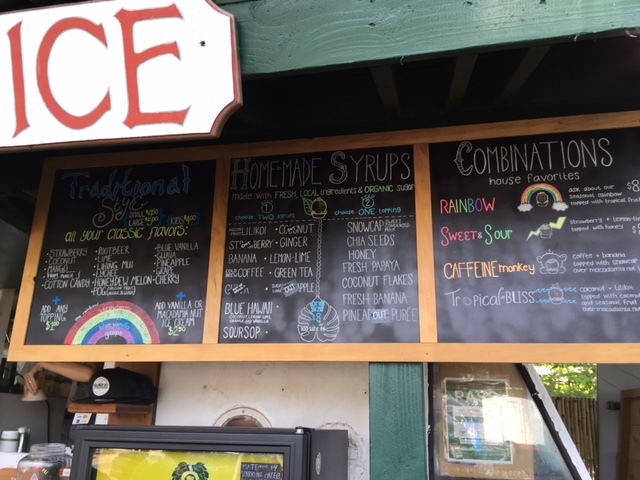 Shave ice made with traditional syrups are priced according to size: keiki is $4.00, small is $4.50 and large is $6.00. Ice cream (either macadamia nut or vanilla) can be added for $2.00 more, and a snow cap adds another $1.00 to your order. Shave ice made with homemade syrups come in two sizes: keiki ($6.00) and regular ($8.00), and ice cream is still $2.00 extra, but toppings are included. Wishing Well’s combos are each priced differently, from $8.00 to $11.00, but some include a special ice cream flavor and toppings as well. Wishing Well also sells acai bowls and coffee, and they accept debit and credit cards. WenYu wanted green tea shave ice again, but they were out of the syrup so she instead ordered a small traditional mango and lychee combo over macadamia ice cream with a snow cap, and said it was delicious. YaYu ordered a lemon-lime combo over vanilla ice cream with a snow cap, but thought the syrups tasted a bit weird and said she wouldn’t order it again. Both agreed the ice was nice and fluffy though. 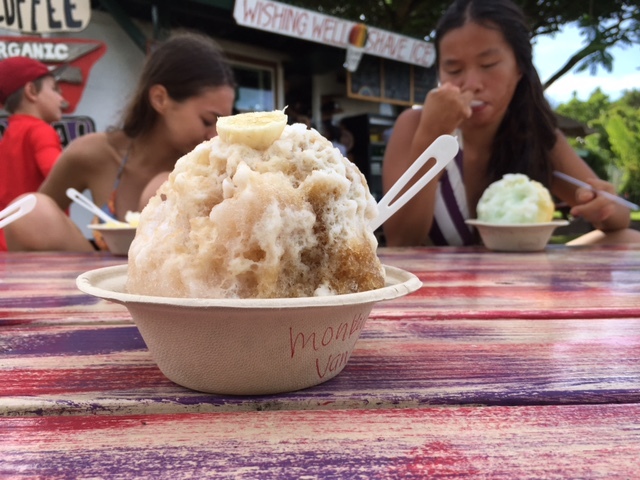 Brett ordered the Caffeine Monkey combo, macadamia nut ice cream with coffee and banana shave ice and topped with fresh banana slices, a refreshing combo after a hot day on the trail. In our family’s opinion, Wishing Well Shave Ice is well worth the stop if you’re visiting the north shore (maybe avoid the lemon/lime combo though). It’s a bit expensive as far a shave ice goes, but great for a special treat. And, you never know who you might run into! Thanks for posting these reviews of the shave ice places. It looks like I might be able to swing a trip to Kauai late August so I definitely will try to check some of these out. I was also reading a review online of a place called JoJo’s. Have you been to that one? The reviewer was raving about the coconut flavor with macadamia nut ice cream. Another one of your posts that got stuck in spam! I have approved you and yet . . . . (thanks, WordPress – NOT). Yes, we have been to JoJo’s and it is VERY good. The thing most people don’t realize though is that there are two JoJo’s in Waimea. The one on the main road was the location of the original JoJo’s, and the new owners kept the name. The original JoJo moved her shop across the road in town (it’s near the bank). Locals don’t go to the one on the main highway – they want the original! A sweet, young couple bought the Wishing Well last fall. The red headed woman that previously owned it struck fear in the hearts of many. (Think soup nazi) The hours she opened were erratic at best. BUT, she did have a reputation for the best shave ice on the island which is why people put up with her. The new owners are doing quite well it seems. I took my company there last year and they were delighted at the delicious shave ice and service. There’s probably an equal amount that would have argued that JoJo’s down in Waimea is the best. And I know locals that don’t like either of those places! Everyone has their favorite shave ice stand. 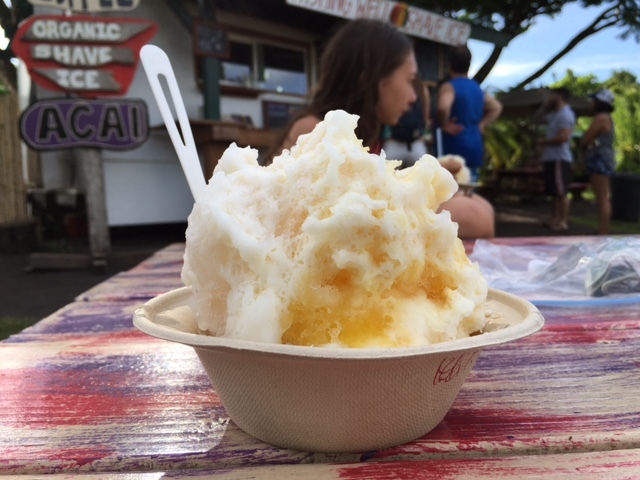 Personally, Tege Tege in Kapaa is now my favorite – their hand-shaved ice is super fluffy, and I love their natural flavors. Thanks for posting these reviews of the shave ice places. It looks like I’m going to be coming to Kauai in a couple of months so now I’ll know which ones to try!